Training a neural network usually involves defining a loss function, which tells the network how close or far it is from its objective. For example, image classification networks are often given a loss function that penalizes them for giving wrong classifications; a network that mislabels a dog picture as a cat will get a high loss. However, not all problems have easily-defined loss functions, especially if they involve human perception, such as image compression or text-to-speech systems. Generative Adversarial Networks (GANs), a machine learning technique that has led to improvements in a wide range of applications including generating images from text, superresolution, and helping robots learn to grasp, offer a solution. However, GANs introduce new theoretical and software engineering challenges, and it can be difficult to keep up with the rapid pace of GAN research. A video of a generator improving over time. It begins by producing random noise, and eventually learns to generate MNIST digits. In order to make GANs easier to experiment with, we’ve open sourced TFGAN, a lightweight library designed to make it easy to train and evaluate GANs. It provides the infrastructure to easily train a GAN, provides well-tested loss and evaluation metrics, and gives easy-to-use examples that highlight the expressiveness and flexibility of TFGAN. We’ve also released a tutorial that includes a high-level API to quickly get a model trained on your data. This demonstrates the effect of an adversarial loss on image compression. The top row shows image patches from the ImageNet dataset. The middle row shows the results of compressing and uncompressing an image through an image compression neural network trained on a traditional loss. The bottom row shows the results from a network trained with a traditional loss and an adversarial loss. The GAN-loss images are sharper and more detailed, even if they are less like the original. TFGAN supports experiments in a few important ways. It provides simple function calls that cover the majority of GAN use-cases so you can get a model running on your data in just a few lines of code, but is built in a modular way to cover more exotic GAN designs as well. You can just use the modules you want — loss, evaluation, features, training, etc. are all independent. TFGAN’s lightweight design also means you can use it alongside other frameworks, or with native TensorFlow code. GAN models written using TFGAN will easily benefit from future infrastructure improvements, and you can select from a large number of already-implemented losses and features without having to rewrite your own. Lastly, the code is well-tested, so you don’t have to worry about numerical or statistical mistakes that are easily made with GAN libraries. 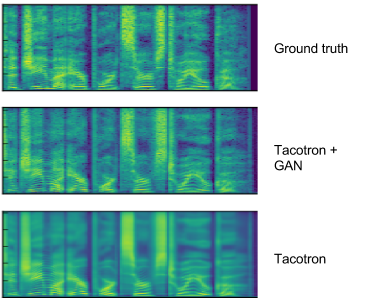 Most neural text-to-speech (TTS) systems produce over-smoothed spectrograms. When applied to the Tacotron TTS system, a GAN can recreate some of the realistic-texture, which reduces artifacts in the resulting audio. When you use TFGAN, you’ll be using the same infrastructure that many Google researchers use, and you’ll have access to the cutting-edge improvements that we develop with the library. Anyone can contribute to the github repositories, which we hope will facilitate code-sharing among ML researchers and users.